Just one thing to get out of the way before I begin. If you’re paying attention, you’ll see that I’ve tagged this post both “annual” and “perennial.” That’s because most of the mums (and let’s just call them that, shall we? In my brief career in retail gardening, they went from chrysanthemum to leucanthemum to dendranthemum back to chrysanthemum. Thankfully, “mum” was always correct.) sold in my part of the country will not over-winter unless they are planted in the ground very early–and by early, I mean July. Since most folks don’t even want to think about mums that early, even if you can get them (and yes, you can get them in July–I have done it and they have over-wintered and I’ve had them for 8 seasons now, even through the last 2 brutal winters–that’s how I know it can be done! ), most of us in New England treat these plants as just more fall blooming annuals–sort of like the pansies, cabbages and kale that are sold this time of year. 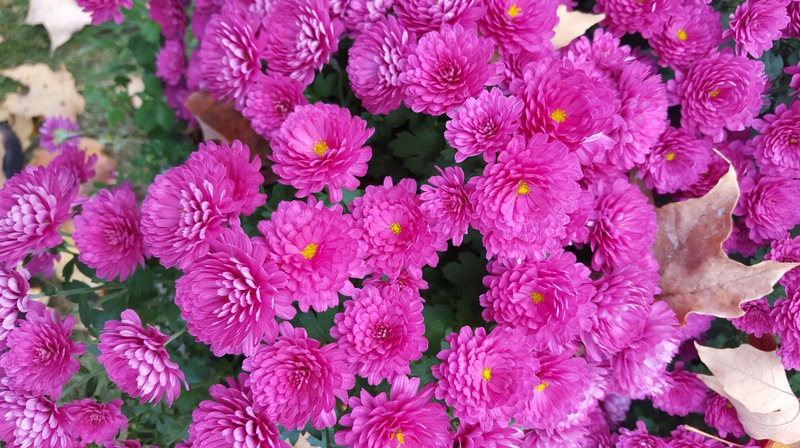 There are a couple of perennial true chrysanthemums, but they come in colors like pale pink, not the fall colors most of us associate with mums so most folks don’t plant them for obvious reasons. They are also very late bloomers in my part of the country–they are just coming into bloom in the last week of October/first week of November so it is often a race to see whether they will flower or get hit with an untimely storm that will kill them. Again, not optimal. Or, they get buried in leaves. Also not ideal. As you might imagine, I don’t use mums much at my house. They might fill a void–as the one that I planted in July 8 years ago did! It took the place of another annual that had “up and died” in the middle of the summer. Finding good looking annuals in mid-July can be a challenge and the place where it was going doesn’t have a lot of soil–certainly nothing suitable for many perennials (although I’ve since filled in with heuchera that are doing nicely.) So a 4″ mum fit the bill. I left it to over-winter, since I’d planted it so early. And 8 years later, it’s still growing and flowering. Who knew? Last year I found a lovely pot of 3 mums planted together that I indulged in. This year I filled a planter of worm-ravaged petunias with mums. That’s about as many mums as you’ll ever find on my property. If I’m going to bring something in, I prefer it to be asters, so there will be some nectar for my pollinators. I’ve never seen a thing on the mums. As for the love/hate thing? Well, every year when the mums come out, I hate it. They remind me of fall and fall of course, while it is a lovely season by itself, means the end of outdoor gardening and the coming of winter. That never makes me happy! But recently I’ve read a couple of different articles singing the praises of mums. One was in the Washington Post (which still has 2 garden writers while most papers have done away with garden writing altogether so kudos to them!) and the other was in Flower magazine. I’ve included links in case you’re interested. The photos in the Post article are amazing!